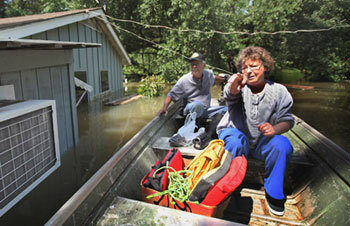 Guy and Diane Creekmore check out their flooded home in Chickasaw neighborhood, Vicksburg, Mississippi, May 18. Mississippi River at Vicksburg is expected to crest at 57.5 feet May 19, surpassing 1927 record by more than a foot. To date, a mere $5 million in Federal Emergency Management Agency funds had been approved for the entire state. METROPOLIS, IllinoisWorking people in this southern Illinois town of 6,000 are struggling to recover after flooding by the Ohio River destroyed or severely damaged at least 250 homes. They have yet to receive a penny of federal aid. Further south along the Mississippi River the worst is yet to come. With the May 14 opening of the Morganza spillway in Louisiana by the U.S. Army Corps of Engineers, hundreds of thousands of acres of farmland and thousands of homes are being flooded to relieve pressure on the levee systems of Baton Rouge and New Orleans. The Mississippi River is expected to crest at Vicksburg, Mississippi, at 57.5 feet, a foot higher than during the 1927 flood, one of the worst in U.S. history. This is not just a natural disaster. The tens of thousands who have lost their homes were living on floodplains because they couldnt afford to rent or buy on higher ground. Capitalist land developers built up the floodplains to rake in the profit from rents, and big shipping companies and dredgers pushed for changing the landscape of the river basin to expand ship traffic with no heed to the flood dangers that entailed. The federal government approved the projects. Now, with tens of thousands evacuated, millions of acres of farmland flooded, and thousands unemployed, the administration of President Barack Obama has barely lifted a finger to provide relief. Illinois officials say they are requesting federal flood aid, but dont expect any unless the damage officially totals $16.5 million. Meanwhile, many working people have been denied insurance claims for their losses, since most insurance doesnt cover damage from floods. By last week the waters had largely receded, although some low-lying parts of the town are still submerged. Cairo, a working-class town of nearly 3,00060 percent of whom are African Americanhad an official unemployment rate of 12 percent before the flood. Residents were evacuated for the first 11 days of May. But when they returned state police enforced an 8:00 p.m. curfew as an excuse to harass and intimidate people especially in the projects, according to a young man who asked that his name not be used. He said he hoped the Militant would tell the truth about whats happening to working people in Cairo. People had to use their rent money just to survive during the evacuation, said Gita Martin, an unemployed worker from Cairo. Her mother, Doris Love, who is a cook at the public high school, said she has been without work for two weeks now. This reporter along with another Militant volunteer sold four new subscriptions and one six-month renewal to workers in Metropolis and Cairo during the two-day reporting trip. If its a working-class paper, then I definitely want it! said a millwright in Metropolis who had worked on clean-up at the site of the former World Trade Center. He wanted to know the papers position on the assassination of Osama Bin Laden. After listening to an explanation of how the U.S. government will use the commando raid to step up their attacks on the working class here and around the world, he decided to subscribe and buy a copy of The Changing Face of US Politics: Working-Class Politics and the Trade Unions.